I’m guessing some of you reading this right now might not think you’re very creative. But . . . you are. Like Liz Gilbert says, “If you’re alive, you’re a creative person.” Creativity is simply the ability to take what’s sitting in front of you, and to build something new out of it. Maybe that’s a new idea, a new strategy, a new event, or even a new system or process that helps you be more efficient. Creativity is simply about solving problems. And that’s something everyone can do. Whether you’re a business professional or a ministry professional, this conversation matters for all of us because it’s easy for all of us to get stuck doing things the way we’ve always done them. But the world around us is changing and so are the people we’re influencing, which means we need to constantly be reevaluating and reinventing the way we reach those people. But creativity doesn’t always come easily. Especially when we’re stressed and overworked and trying to juggle all of the craziness of our jobs. Sometimes, you’ve got to work for creativity. You’ve got to cultivate it. So here are 5 things I’ve learned about how to become, and stay, a little bit more creative. If you want to be creative . . . Many of us have a tendency to kind of work ourselves to death, you know? Sometimes it feels like our job is never done or like we can’t unplug when we head home. But here’s the thing. When you’re overworked, you don’t have the space or the capacity you need to chase down inspiration or let new ideas grow. To be creative, you need rest. So close your laptop. Take a break. Take some naps. Meditate. And prioritize having fun and spending time with people who give you life. When you do, you’ll be more focused, you’ll have a lot more mental room for creativity. I’m kind of a huge nerd, so this one is my favorite — learning is absolutely essential to fostering creativity. But we can easily become a little “ingrown” in terms of what we’re learning. Sometimes we get so passionate about the specific area of work or ministry that we care about (which is understandable) that we fill our brains to capacity with content directly related to our fields. On one hand, that makes sense, because we want to become experts in our fields. But when it comes to fostering creativity, it’s actually not always the best approach. Some of the greatest creators and innovators in human history weren’t just experts in one specific field. They were “expert generalists” (a phrase I learned from Art Markman) — people with a wide knowledge base. Instead of learning everything there was to know about one topic, these people learned a little bit about a lot of topics — even those topics completely unrelated to their day jobs. So if you want to be more creative, try learning about something that has absolutely nothing to do with your job, like broccoli, or the root systems of trees, or how to write a great infomercial. It doesn’t matter. Find something that interests you, learn about it, and repeat. Albert Einstein said, “I have no special talents. I am only passionately curious.” The most creative and innovative people I know are always the most curious. They’re people who are always asking questions.When you make a habit of asking questions, you open yourself up to the possibility that you haven’t yet arrived, that you don’t actually have it all figured out, and that there’s still room for improvement. And that openness is absolutely essential to creativity. If you always try to be creative alone, you’ll probably run out of ideas pretty quickly. If you’re trying to build something that matters, something that lasts, something that’s bigger than yourself, then you need to involve more people. Creativity works best as a team sport. When you take your creativity and then add the unique strengths, perspectives, voices, and skills of other people, that collaboration will make all of your ideas better. So don’t try to be creative in a vacuum. Involve more people. They’ll make you better. I get that trying something new can be risky. When you’re trying something new, it’s can feel kind of terrifying. You wonder if people will like it or if you’ll put in a million hours of hard work only to watch this thing you created totally crash and burn in front of you. I get it. But I’ve also found that failure really is just part of the creative process. Actually, failure is kind of awesome. I mean, think of it this way. Every time you try something new and it totally bombs, you’re one step closer to finding something that actually does work. So, actually, failure is a gift. And hey — the more risks you take for the sake of creativity, the less scary it will eventually start to feel. So there you go. 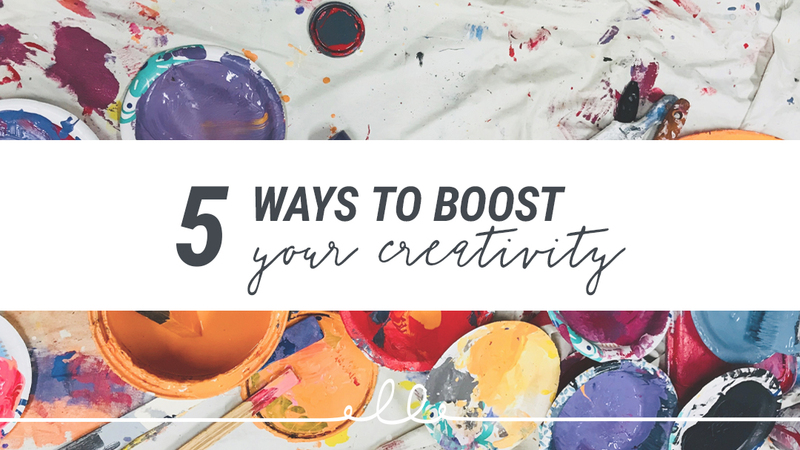 Those are my five tips for being more creative. It’s not a complete list, but these five things that have really made a difference for me. And it’s not really a checklist either — it’s not something you can complete once and for all. It’s more of an ongoing process. Some days you’ll be better at fostering creativity than others. Some seasons will be harder or busier or more inspiring than others. That’s okay. But wherever you’re at right now, just try this. Pick one of these five things that you’re going to work on this week. Just one. That’s it. Then do it. I think it’ll make you better, I think it’ll make your team better, and I think it’ll make your work better too. So try it out! Get some rest. Learn some stuff. Ask some questions. Involve some people. Take some risks.